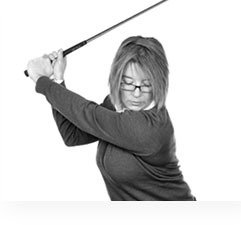 One of the most common questions I get asked as a golf pro by ladies that I’m helping to improve their game is ‘what’s the difference between chipping and pitching?’ and really the only difference between it is the distance that the shot’s going to go. A chip will tend to be a shorter shot and a pitch tends to be a longer shot. So, it’s really on the distance but there isn’t a set distance where chipping becomes pitching. It depends on you as an individual and how far you strike the golf ball. So let’s initially just look at how to chip. If you’re going to play a chip shot, I think use your seven iron and that’s going to be the best club to play this with. We’re going to hit the ball so that it does go up into the air slightly but it’s going to have a slightly lower flight so that when it lands it then rolls along the floor. So the way we are going to set up for that is to get the ball in the middle of the feet, the left foot directly back and the weight on the left. That’s going to just open the stance to make it easier for you to turn through the shot but you’ll retain your alignment with your shoulders. Aim the club face at the target and play the hands lows down the handle for control with the club head. We’re going to set the hands forward so we’ve got this really straight line and then to play the chip we just maintain that straight line throughout the shot. So we have an equal backswing length to follow through length, and we just work on taking that line back and just clipping the floor as we hit the ball, we’ve gone into an equal distance position on the follow through. You can see my body is just turned towards the target but I’ve maintained that straight line. So if we look in terms of using an alignment pole, if you struggle with your chipping, just hold the alignment pole at the back of the club so you’re extending the club up the back of your left arm and then play the shot with the pole just anchored onto your left rib cage. So that’s a really effective way to play a chip. Now if we look at how to play a pitch, we’re going to swap the club and go from a lofted club. So we’re going to play with a wedge or a sand iron here. And when we play this shot, we’ll set up in a really similar position so we’ve got the ball in the centre of the feet, we’ve got the weight on the left and we start with this really straight line, down the left arm, from the left shoulder into the club head through the shaft. But when you’re playing a pitch, you’re going to make a slightly bigger backswing. So you’re going to use your wrist a little bit more. So this time you can see the alignment pole is coming away from my body. It’s no longer anchored on my left rib cage. And that’s really the biggest difference between chipping and pitching, is you’re using your wrist a little bit more. But it will depend on the size of the shot as to when you use your wrist. So as you swing the club back, you don’t use your wrist until your hands have gone past your right thigh. Once your hands have passed your right thigh, if you still need more distance for the club head to travel to pick speed up to hit the ball further, then you would use your wrist and you would start to point the end of the club or the pole in this case, down at the ball. And depending on how much you do that and how far around you swing, will dictate how far the ball goes. So the next time you are in a situation where you’re not sure whether to chip or pitch, really look at the distance that you’re hitting. Look at how far you make the ball go just by chipping so that your hand swing just passed your right thigh with the club pointing down. If you need a bigger shot then you’re going to start pitching. But the only difference is, is that when you pitch, you’ll just hinge your wrist. And you’ll notice as a follow through, there’s more wrist hinge as well as a follow through. So that’s really the main difference between chipping and pitching and when you should choose one over the other, that’s going to be dictated by how far you as an individual hit the golf ball.